I found this lovely bath set at an after holiday sale and couldn’t resist buying it. 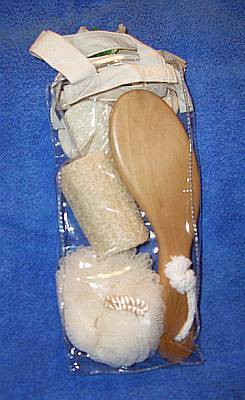 It’s got everything a girl needs for bath time; a couple of loofah scrubs, a mesh sponge, and a nice wooden bath brush. That’s right, a handy little bath brush. Not that the brush will ever be used for it’s intended purposes. I know a spanking toy when I see one, and I couldn’t believe my good luck in finding such a pretty new toy and it was on sale, too! I thought that by getting another bath brush, Dan would have an alternative to the big bath brush for those after-shower spankings we both enjoy. A nicer alternative, I should say. When Dan uses the big brush, he only gives me a few swats because it’s heavy and doesn’t take much to leave an impression. Especially since we only play with it when I’m fresh from a shower and my bottom is all soft and tender. I thought a lighter brush would make a nice change once in a while. It’s nice alright – nice and stingy! Although not as intense as the big brush, is easier to handle and because it’s lighter, can be used longer…much longer. I found that out the other morning when I got to spend quite a bit of time bent over the side of the bed while Dan used it to color my bottom a pretty shade of red. I had a nice glow going for quite a while after that, I must admit. I doubt it’s the same glow the people who packaged that set intended, but I’m happy. And it was on sale! Yay!